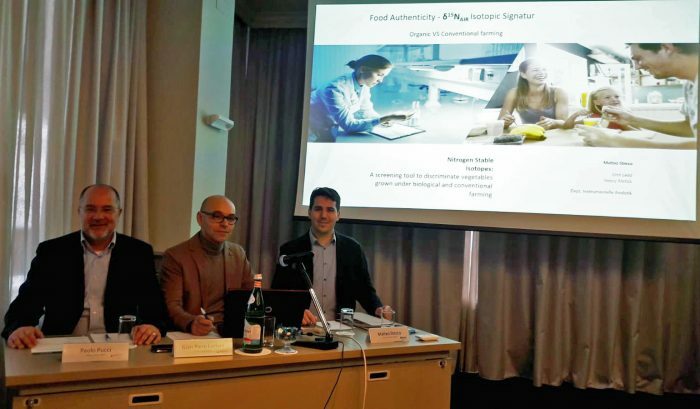 On Friday, 18.01.2019 the seminar “Nitrogen Stable Isotopes – A screening tool to discriminate vegetables grown under biological and conventional farming” took place in Bologna (IT). The meeting was planned and held by Tentamus Agriparadigma and bilacon (based in Berlin, GER), focussing on the new technologies and achievements that have been achieved through Matteo Stecca, Head of the Heavy Metals Department at the Berlin laboratory. During the meeting, the methodological aspects, limitations and possibilities of this technique were described. The aim of this new method is to introduce an unconventional and complementary alternative to the analysis of residues for samples from organic farming. The meeting was attended by important representatives of the production, control and distribution of the food supply chain. The great interest and debate on this issue will lead to further insights.